Some Qt applications look out of place in Gnome (and other Gtk-based desktop environments). If all you want is to get Qt5 applications to look decent on your Linux desktop, you can use the QT_QPA_PLATFORMTHEME=gtk2 export tweak we mentioned a couple of weeks ago. 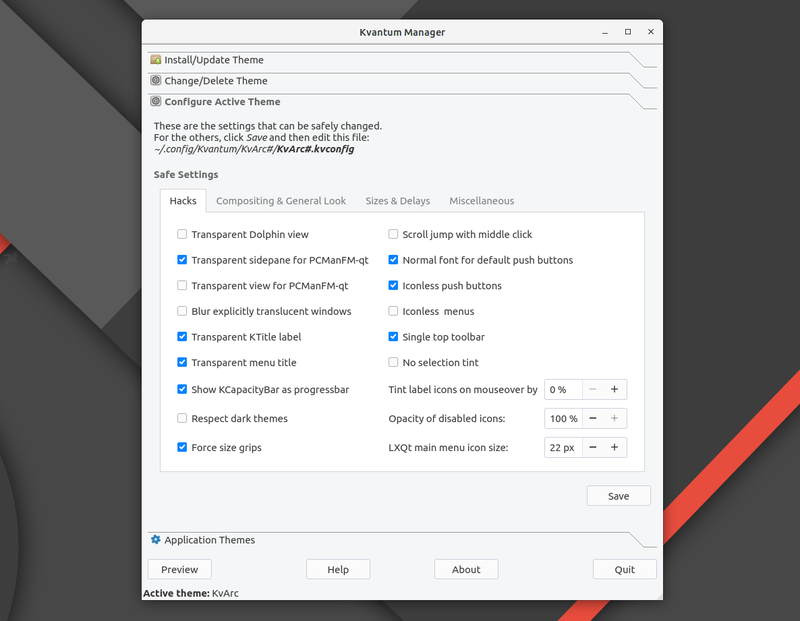 To be able to choose the theme Qt applications are using on your Linux system, tweak some settings, and have an overall better integration with Gnome / Gtk, you can give Kvantum a try. This is a SVG-based theme engine for both Qt4 and Qt5, KDE and LXQt. Using it, you'll not only be able to theme Qt4 and Qt5 software to match your current Gtk theme almost entirely (as long as your current Gtk theme has a Kvantum theme available), but also configure some Qt theme-related settings. The idea behind Kvantum - to use SVG images to style Qt widgets - comes from QuantumStyle, which is not developed any more, but is continued as QSvgStyle. I find QSvgStyle more difficult to use than Kvantum though, because it only comes with one built-in theme. It's important to mention that Kvantum and other similar tools cannot change the Qt theme for applications installed from Snap, Flatpak or AppImage binaries. You can find the Kvantum installation instructions for some Linux distributions here. While the latest source available on the Kvantum releases page is version 0.10.6, there's a newer Kvantum version available, released today. Since the source is not yet available on the releases page, you can get it by grabbing the latest Kvantum code via Git. Use either of these, as the instructions below should work with any of them, or at least it worked for me in Ubuntu 18.04. This builds and installs Kvantum for Qt 5, which should be enough since most applications use Qt 5 nowadays. If you want to build it for Qt4, use the same instructions as above but add -DENABLE_QT4=ON after the cmake .. command from step 3. 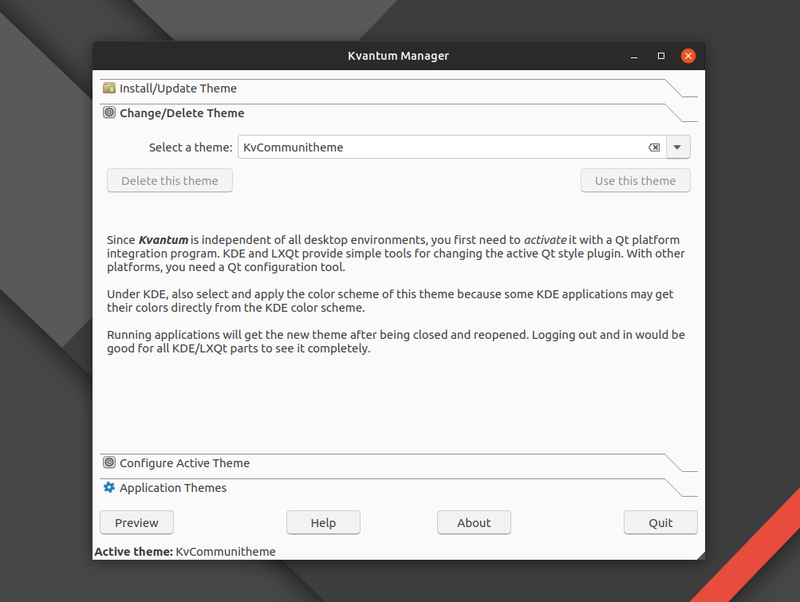 For desktop environments such as KDE and LXQt, using Kvantum is a lot easier - select Kvantum under Widget Style and Color Scheme and that's all. 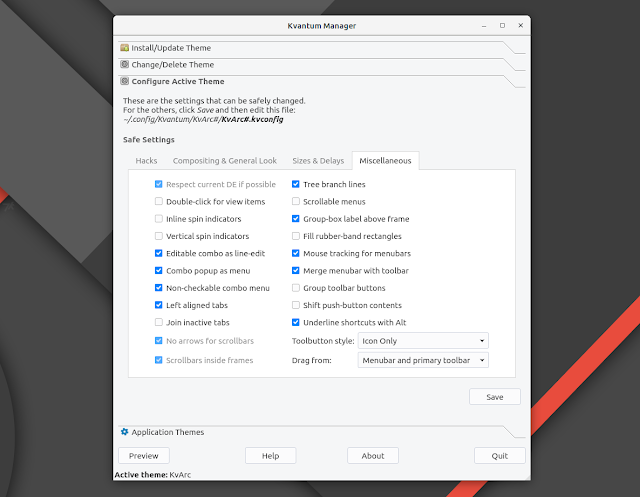 Now all you have to do is run Kvantum and select the theme you want to use, and tweak the settings to suit your needs.